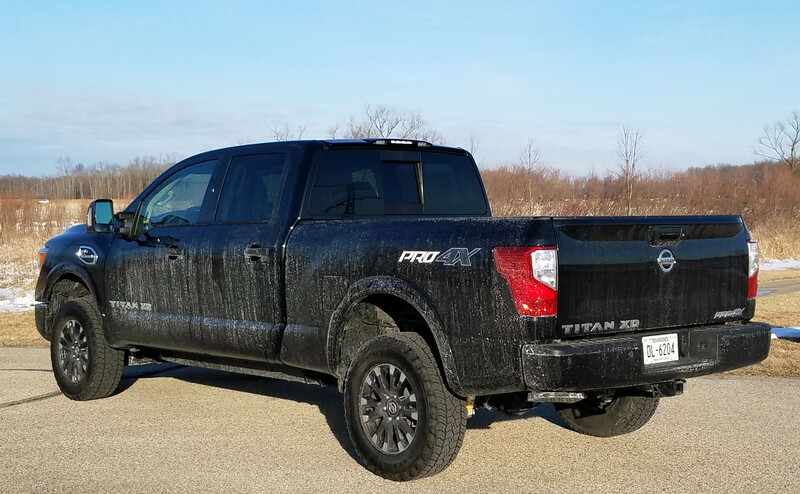 Nissan Titan XD diesel, the locomotive of pickups . . .
Let’s be honest, all the large heavy-duty pickups are pretty much alike in how they drive and the features they pack. Pricing is also very close. 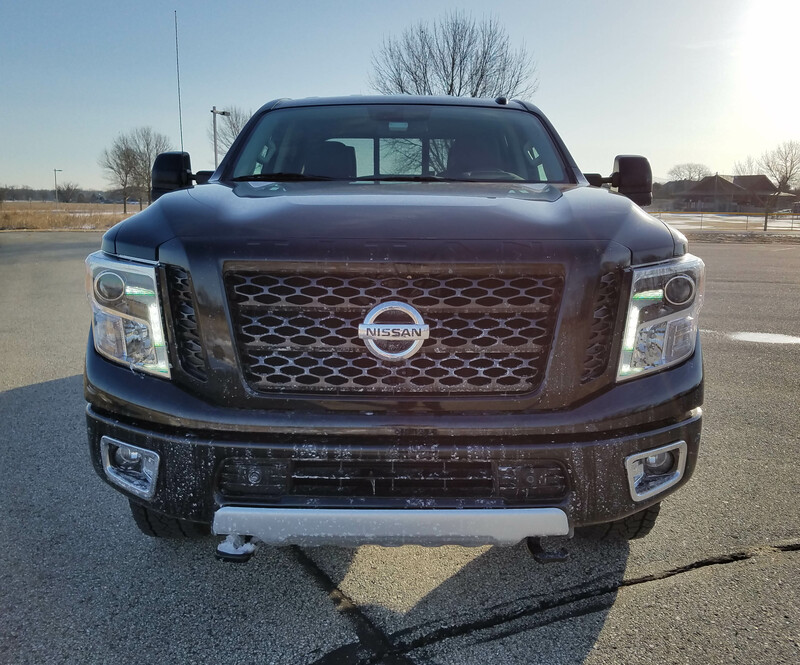 But some just look more serious than the others and I think of this week’s test truck, the 2018 Nissan Titan XD Pro-4X with a Cummins diesel engine 4-wheel drive as a locomotive for the street. It’s tall and wide and rumbles like a locomotive waiting to inch away from the station, or stoplight. That 5.0-liter turbo-diesel V8 is a monster that delivers a crazy 555 ft.-lbs. of torque that allows Titan XD to pull up to 11,330 lbs. Heck, this crew cab model weighs a hefty 7,246 lbs., so just pulling itself along the road is pretty impressive. To be fair I must tell you that the Ford F-150 I tested last week will pull even more. But the F-150 feels sophisticated and luxurious. It had power running boards that lowered to help you climb aboard. This Titan though seems more menacing and just climbing aboard is no small feat. No running boards here bucko, just a full 24-inch stretch of the leg to sidle up into this cockpit’s saddle. 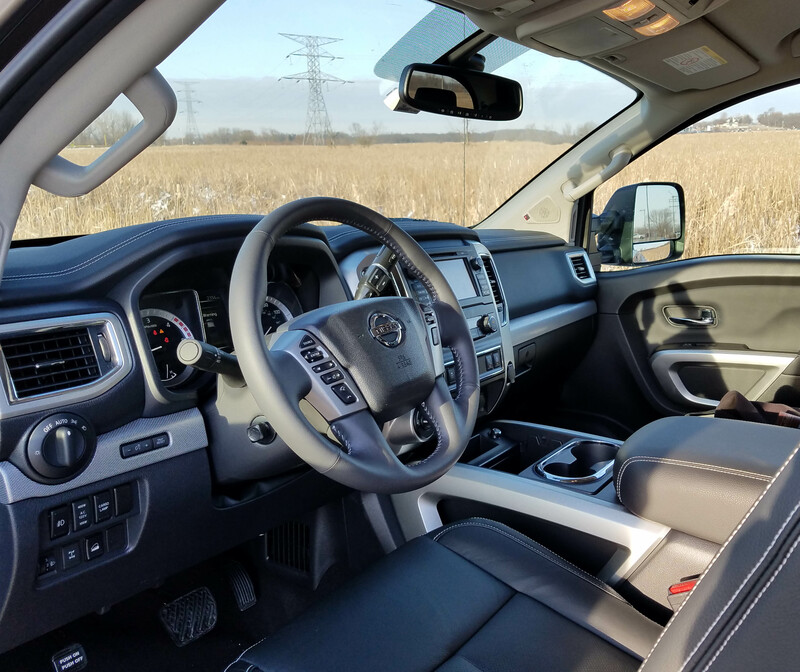 Make no mistake, this isn’t a bare bones work truck, the Pro-4X has a loaded luxury leather interior, black in this black test truck with the leather featuring white stitching on the dash and seats. Trim is matte silver on the console, stack surrounds and steering wheel hub, with chrome on the air vents and door release handles. But you’re buying this for its grunt and girth and it packs that in that by the truckload. Fire up the V8 diesel and it rumbles and grumbles. No, not the cloud of blue smoke as in past years’ diesels. These have been cleaned up substantially. But there’s no hint of smooth operation here to plant the seeds of luxury. This sounds like the late Andre the Giant’s tummy after a big meal. Usually you must press the Start button twice to get it to fire on a 25- to 30-degree morning. Sometimes if you hold the Start button long enough the first time it’ll turn the engine over. It never sounds eager. After a mile or two each morning (depending on how cold it was) the diesel seemed to limber up and acceleration was strong, but always with a good lag between accelerator depression and forward progress. There’s always a rumble too, the engine never is as quiet as a gasoline-powered version. But the diesel’s low-end torque is pretty sweet. Fuel mileage was low. I got just 14.2 miles per gallon, and remember, this is $3-a-gallon diesel fuel, so I got no change back from my $50 bill for a week’s fuel. The EPA doesn’t rate these heavy-duty pickups’ fuel economy, and none are good. I got 13.8 mpg in a diesel-powered Ford F-250 Super Duty a few weeks back. Ride is typical of all big pickups, relatively smooth most of the time because of its long wheelbase. This one is 151.6 inches. Last week’s F-150 was 145 inches. There is some bounce over large road and off-road imperfections, but exactly what you’d expect in any pickup. Handling is big truck bland with plenty of play in the steering wheel, which has a fairly heavy turning effort. Engaging the 4-wheel-drive system is easy enough, with a knob below the Start button. 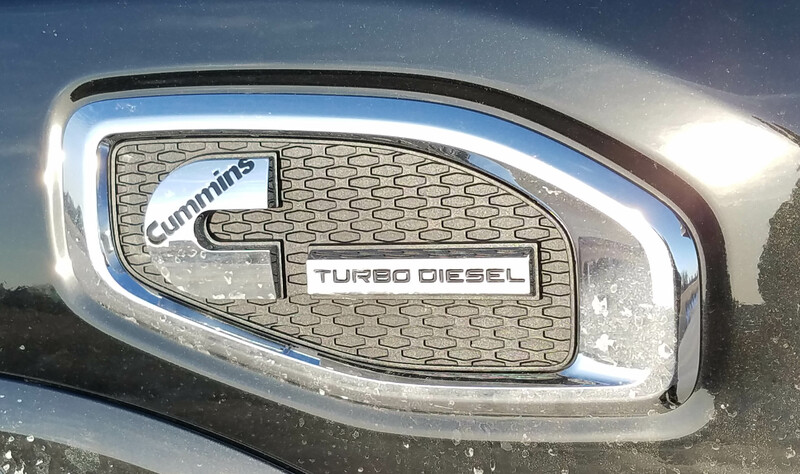 Turn that and select your setting for on- or off-road rumbling. Inside this cab you could carry five adults comfortably though, three in back, two in front. 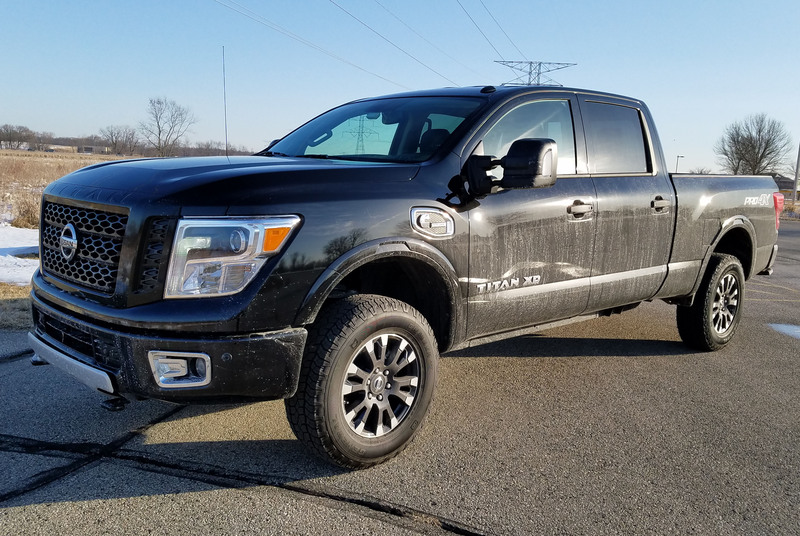 A bench seat is available in the entry-level Titan S model, so if you need room for six, well, it’s an option. Again, you may need a stepladder if any of your riders are shorter than 5-5. That’s my height on a good morning and after a week of climbing into and then dropping out of the cab I’m still nursing sore leg muscles. A running board really is necessary here. But once inside you’re comfy as can be. The front seats are powered and the bottom leather cushion is wide and the back mildly contoured. These would be fine seats for a long trip. The driver’s seat also has two memory settings and both front and rear seats are heated, part of the $3,545 Convenience Package added here. A thick leather heated steering wheel also is part of that, along with remote engine start, HomeLink, NissanConnect infotainment and auto-dimming mirrors. Cooled front seats are part of the gig here too, thanks to a $1,545 Premium Package that also includes a 360-degree monitor and rearview mirrors that tilt automatically when the truck is in reverse. Titan’s dash is well laid out. But the touchscreen is a bit small (7 inches) considering the mammoth size of the dash and interior. But everything worked well and was intuitive. There are knobs for tuning the radio and boosting the volume. I still prefer those. And get this, the Titan still has a CD player. Bravo! Additionally, most dash buttons and other knobs for climate controls are appropriately large. Another cool feature is the power sliding rear window. This is becoming commonplace now, but good to have if you must extend a long item in the bed through that window into the cab. The power window is part of an appropriately named Utility Package that costs $1,445. The package also includes front and rear sonar to help park the truck safely and without dinging anything. It also adds various lighting systems for the bed, a rear utility step, electronic locking tailgate and a 12-speaker Rockford Fosgate premium stereo. Folks using this as a work truck also will like Nissan’s Utili-track channel system in the lined bed. It includes four adjustable tie-down cleats that can be a big help when securing a load for hauling. Oddly, in a pricey high-end pickup, there was no sunroof. But overhead is an SOS emergency system and sun visors that slide. Safety equipment is well represented too, from the backup camera to the blind-spot warning system and rear cross-traffic alert. No lane departure system here, but that’s just fine. 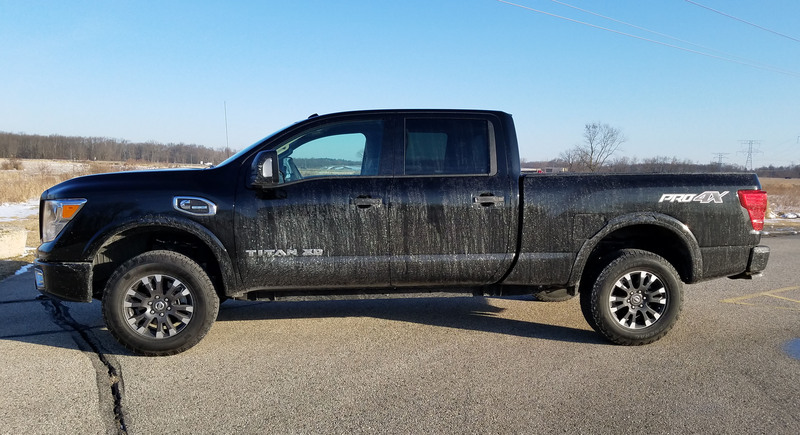 The tested Titan XD Pro-4X starts at $54,425, including delivery, and this one settled at $60,960 after its various options were added. But remember this is a heavy-duty pickup with a heavier frame for hauling and towing. That diesel adds about $6 grand to the price tag, so if you’re not pulling a horse trailer or other heavy equipment, a gas-powered pickup may do ya! Speaking of which, the base S with 2-wheel-drive and a 5.6-liter V8 starts at $38,535 and adding 4WD bumps it to $41,565. A 4WD diesel S model lists at $46,865. There are five trim levels in all, the Platinum Reserve model topping out at nearly $65,000. Like all large pickups there are many other trim and layout choices. The Titan offers three bed lengths, plus two cabs, the tested crew cab and a single cab with no rear seat and limited storage area inside. 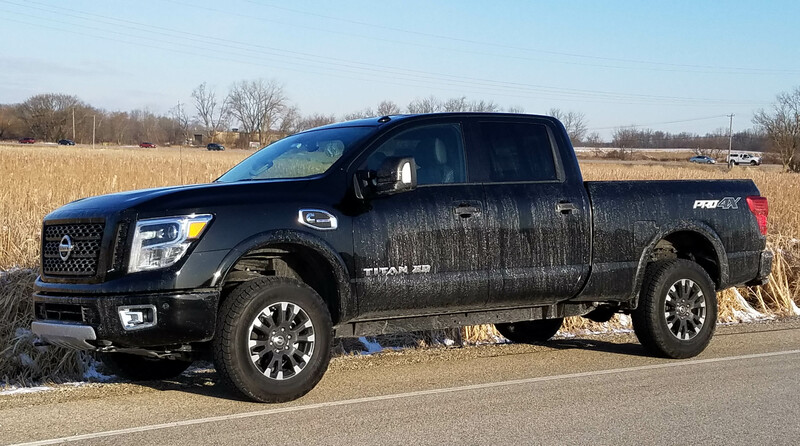 Nissan’s long-term advantage for the Titan is a 5-year, 100,000-mile warranty, best in the biz for a pickup. Certainly the best-selling F-150 is the main competition, both it and the F250 tow more. So do the RAM 2500 from Dodge and Chevy Silverado 2500. But you’ll not find a tougher looking, acting, or sounding pickup. Hits: Big and roomy with strong low-end power for towing, OK ride and 4WD. Heated front and rear seats, heated power tilt/telescope steering wheel, power sliding rear window and good level of safety equipment, plus bedliner. Misses: Rumbly diesel is noisy, starting can be slow along with early morning driveway pull-away. No sunroof, huge step-up height and low, low fuel mileage, plus it drinks pricey diesel. Wow, this is very informative mate! Hey, let’s follow, and share each other to grow together. Thanks!